The S10 feels like an evolution of the Galaxy formula that’s equal parts messy and necessary. It’s not quite the future, but it’s not far off either. Discounting the Note 7, Samsung’s misfires usually sit closer to the sub-optimal than the objectively terrible. If we’re being honest with ourselves, it’s been a fair few years since Samsung made a genuinely bad flagship smartphone. And coming off last year's S9, S9+ And Note 9, Samsung’s biggest sin looked to be predictability. The things you liked about the last Samsung Galaxy flagship? They’re here. The things you didn’t like? They’re probably here as well. Samsung’s modern flagships are built atop a decade of iteration and learning, and it’s hard to shake old habits. And that was my main irk with last year's Samsung devices. I'd seen it all before. 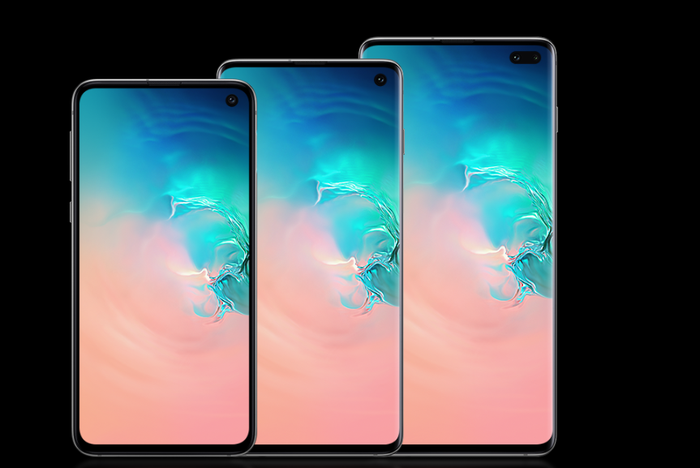 So it’s genuinely refreshing to see Samsung have experimented with this year’s S10e, S10 and S10+. Where last year's crop played things too safe, this year's devices take risks. And even if not all of those risks pay off, it really does feel like Samsung tried to make the S10 the same kind of leap forward that the iPhone X was for Apple. Unfortunately, I'm decidedly mixed on the final results. Rear Camera: 12-megapixel (f/2.4) telephoto lens + 12-megapixel (f/1.5) wide angle lens + 16-megapixel (f/2.2) ultra wide lens. The look and feel of the S10 is pristine. From the moment it's out of the box, it oozes expensive charm - which, given the price-tag, is probably a good thing. If anything, the feel-factor here reminds me most of the iPhone XS. It's cutting edge tech paired up with appropriate luxury aesthetics. To Samsung's credit, it's the first (and only) Android device I've ever used that's managed to strike that same decadent chord. And these flush looks come with plenty of practical perks: IP68 water resistance, headphone jack, fast wireless charging, USB-C fast-charging, dual Dolby speakers and more. Most of this isn't new but it's hardly unwelcome. A few of the usual foibles remain as well. The Bixby button remains, though it can now be remapped to the Google Assistant. And then there's the notch. Well, the hole. At best, it's odd. At worst, it's hideous. I've never been much a notch-hater but the experience of using the S10 really helped me sympathize with their plight in a way I previously hadn't..
At a glance, the visual profile of the S10’s screen is super different to what's come before - which I like - but the notch here is a little too conspicuous for my liking. Samsung do smartly sidestep any UI issues by making S10s notification bar chunkier but then that poses the question of how much extra screen space you’re really getting here. You can always disguise it by blacking out the top bar of the display but, again, it begs questions about whether or not the pros outweigh the cons here. It's also not super practical and, at times, it's hard to see any clear value in this particular evolution. Fundamentally, the S10's circle-notch feels like a compromise that almost isn't worth it. To be clear: all notches are compromises but the advantages of this particular notch aren't readily apparent over the other more established options. There’s no 3D Face Unlock here and the extra screen space rarely feels worth the irregular dimensions you have to work around. That said, there is a new fingerprint sensor. Built into the display as with the Huawei Mate 20 Pro and the Oppo R17 Pro, it'll surely feel like science fiction at first. However, the location of the sensor itself (down towards where the home button used to be) hurts the utility of the feature and, anecdotally, it does feel just that little bit slower than the in-screen sensor of the Mate 20 Pro. There's also a form of reverse wireless charging, called PowerShare. 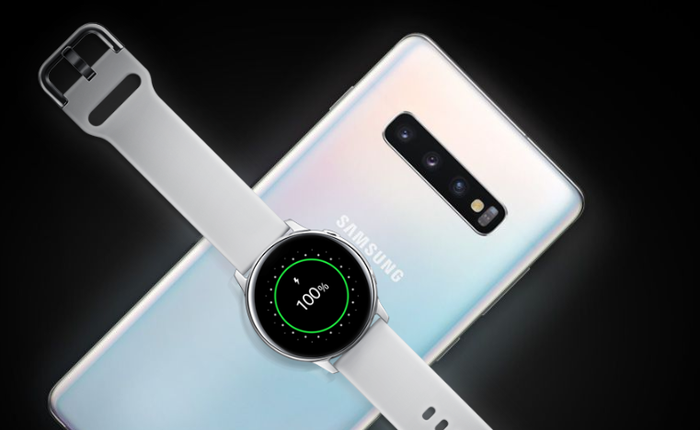 This allows you to not just charge other Qi-compatible smartphones but also recharge Samsung wearables like the new Galaxy Buds and the Galaxy Watch - which is a super neat perk you won't find in the Mate 20 Pro's reverse wireless charging. I really like this feature and I hope Samsung continue to improve upon it in future iterations. Camera - How Does The Samsung Galaxy S10 Compare To The Competition? Going into this year’s Samsung Galaxy S10, I had high hopes around the camera side of the equation. The dual-lens, dual-aperture camera in the S9+ was solid enough but its strengths were quickly eclipsed by that of the Huawei P20 Pro - which was both cheaper & better. And with the S10 and S10+ embracing a triple-lens configuration like that found in the P20 Pro, it seemed like it would be the year Samsung caught up to their Chinese competition. Unfortunately, this is simply not the case. While the camera on the S10 does produce sharp and brightly colored results, it’s rarely feels like a huge upgrade on last year’s camera and it feels like it falls short in almost every area where the alternatives seem to excel. 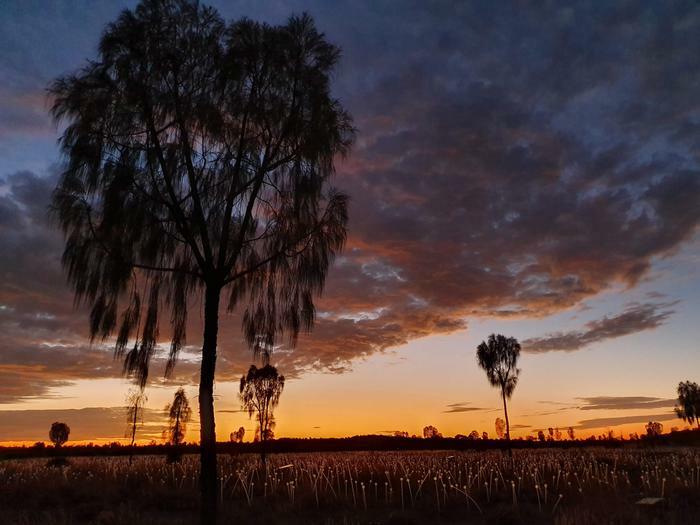 You can take great photos on the S10 but you can’t take the kind of great photos that you can on the P20, Mate 20 or P30 Pro. Daytime shots look well-lit and crisply detailed...but not so much as they would on a Huawei P20 or Mate 20 Pro. 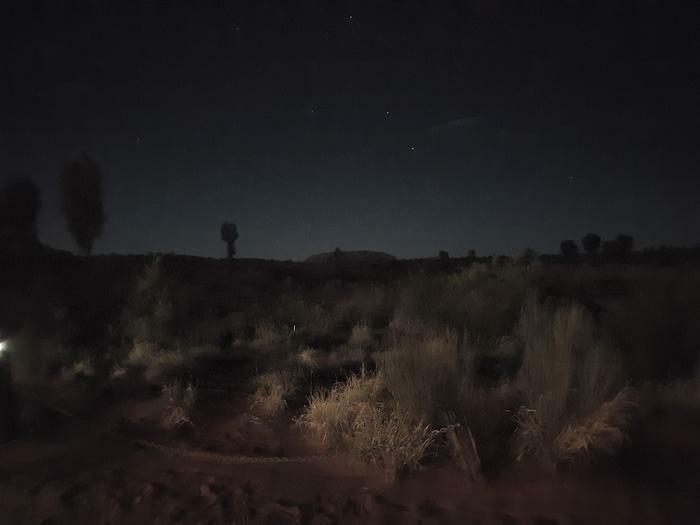 Night time shots look great compared to the bulk of smartphones out there...with the exception of the Huawei P20 or Mate 20 Pro. Bokeh and portrait shots are well-lit and rendered...but not so as much as they would with the Huawei P20 or Mate 20 Pro. Then, there’s the absence of feature parity with Huawei’s competitors. Yes, the S10 does now include a wide-angle lens - which does add valuable utility. However, the limitation of 2x optical zoom compared to 3x and 5x on the P20 Pro (not to mention the 5x and 10x on the P30 Pro) means that there are shots I can take on those cameras that I can’t here. That's frustrating because, camera aside, I pretty much love everything the S10 has going on. Yes, the P30 Pro was announced this week. It might be actually be a little unfair to compare the S10 to it, given the slight difference in price. And if I had finished reviewing the S10 before I had the chance to play with the P30's camera, I might feel more positive about what Samsung have assembled here - but that's not where I'm at. As it stands, I wouldn’t hesitate to argue that the ability to get those far away close-ups does give Huawei’s devices the edge regardless of whether we're talking about the P20 Pro or P30 Pro. And if, after a year, Samsung can’t match that, it's a worrying omen of things to come. 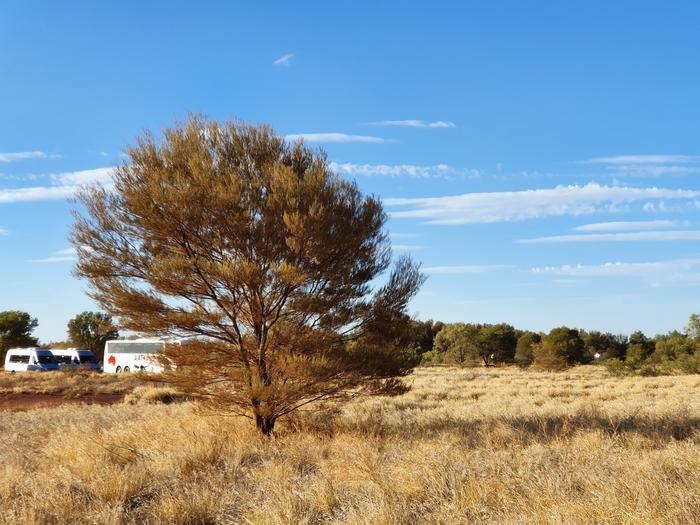 In context, the Galaxy S10’s camera is better than most other smartphone cameras when it comes to basics - and, if you’re after exactly that, you’ll probably come away happy with it. 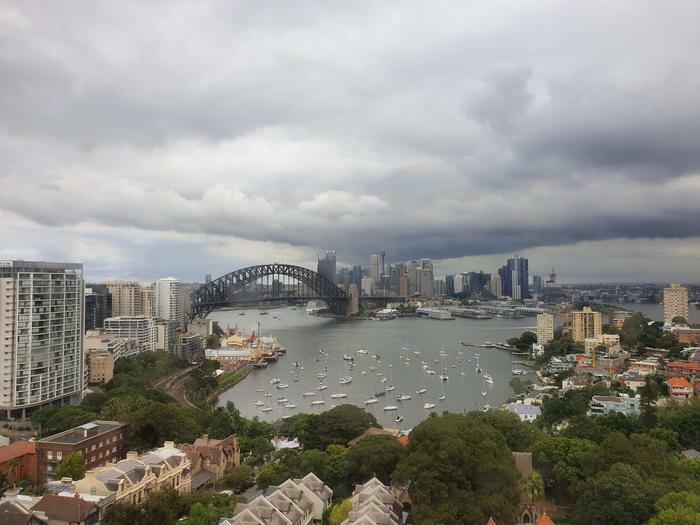 However, it falls short of being the best or smartphone camera out there, and when we’re talking about Samsung (and the price-point that the S10 occupies), that distinction matters. More on this later. Samsung's software has typically thrived on polish but been dragged down by their complexity. The new One UI interface that ships with the S10 resets this status quo in the best possible way. I found it made a great first impression, and things only got better from there. It’s responsive, it’s intuitive, it’s visually clean and deceptively practical. All of Samsung's native apps (plus most Android elements) have been modified to privilege the lower half of the screen - which ends up being a really smart change, since it makes interacting with them both faster, easier and more ergonomic. All told, I'm honestly thrilled with OneUI. I feel like it sets a new high watermark for Android skins that aren't terrible. I wish every Android phone out there felt this good to use from moment-to-moment. The gesture controls here are a little more muddled. I love that Samsung are finally moving away from the navigation bar but the results leave much to be desired. 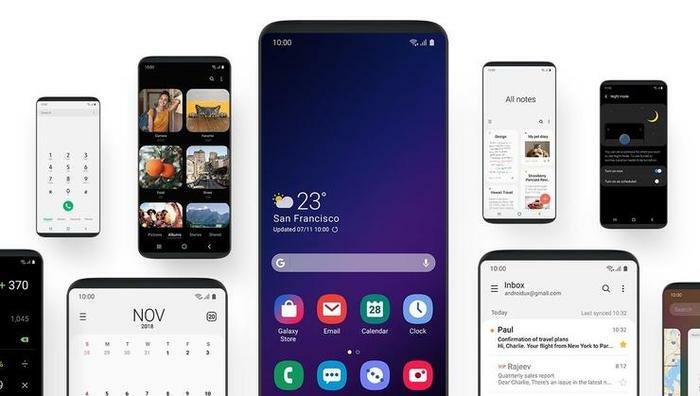 They’re not as responsive or intuitive as alternatives from Huawei and Google's own takes on the gesture navigation and a clear weak-link in the One UI experience. 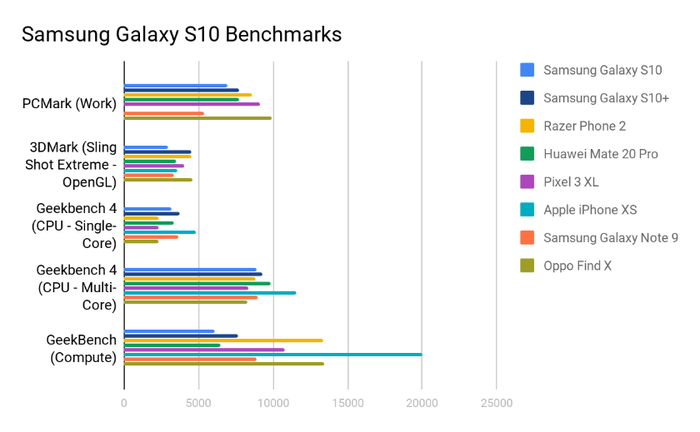 As for benchmarks, the S10 fell short. The results here aren’t bad, but they do fall within the expected range for a flagship device like this and do represent a slight bump upwards on the Galaxy Note 9 on some fronts. 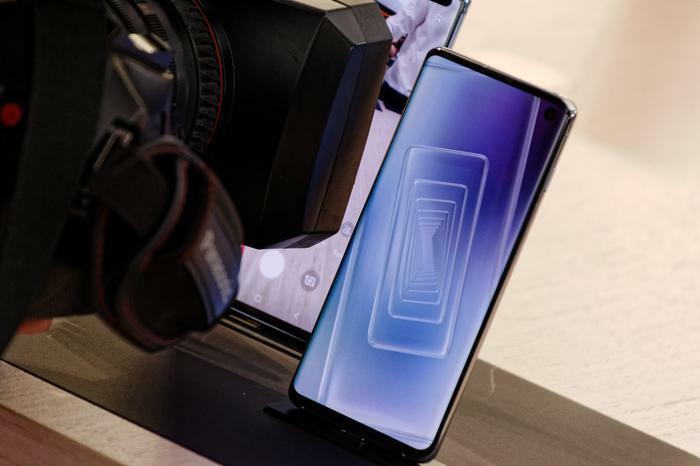 Compared to both Huawei’s Kirin 980 and the Snapdragon 845-powered competition, the Samsung Galaxy S10 can’t compete in raw processing power. Ironically, the S10’s lackluster battery life made it feel like the most iPhone Galaxy smartphone to date. In terms of everyday use, we’d make it through the usual 9-5 work day pretty consistently but did need to make the time for a top up if we planned on doing anything afterwards. We’re talking nine or ten hours of use here, though - as always - your mileage may vary (especially if you watch or film a lot of video content). Like the camera, this feels like another area where the brand are ceding the technological lead to rivals like Huawei - who have reliably had “two-day” battery life on most of their devices for the last year or so. The Bottom Line - Should you buy the Samsung Galaxy S10? I’m not mad but I am a little disappointed. After the skittish incrementalism of the S9 and S9+, I had really high-hopes that the S10 and S10+ would represent something closer to a leap forward for Samsung. And the Galaxy S10 does move things forward - but it doesn't move things forward enough nor does it move forward in directions that feel like they matter. This is Samsung we’re talking about. I expected more. I expected a triple-lens camera just as capable as a Huawei. I expected gesture controls that made navigating the S10 as slick and intuitive as the Pixel. I expected an Exynos processor as powerful as its Snapdragon counterpart and I expected an in-screen fingerprint sensor that learned from the mistakes of the Oppo R17 Pro. Instead, what I got was closer to a personal best. And, on some level, that’s fine. Most people will buy this and have a great time with it. But the problem with personal bests is that the category it occupies - high-end premium smartphone - isn’t a one-man race. As a device, the S10 offers excellence on many fronts. However, across many of these fronts, it feels like Samsung are struggling to keep up rather than leading by example. They're setting the baseline rather than the world record when it comes to the quality of Android smartphones. The Galaxy S10 is great but it falls short of being “the best Android handset” you can buy right now, and that really says it all. Still, if you lean towards more compact handsets, the Galaxy S10 is one of the best Android handsets you can buy in 2019. The aggregate quality of the hardware is head-and-shoulders above most of the competition and the software experience here is arguably the best you can find on Android.